Metal Between Two Faces is a science fiction adventure story set in the not too distant future. It involves the misadventures of one 16 year old Toby Alastor as he becomes embroiled in an unravelling series of events that will shape the future of the earth itself. It features cityscapes of tomorrow, induced mutation, abnormal psychic activity, hallucinatory journeys, nightmarish memories, political corruption, lust, murder, booze, noise, robots, explosions and bloody mayhem. Metal Between Two Faces #1 (13 Pages) – Wherein we’ll be visiting the Boneyard (the result of the Ultralima Shockwave six years previous), Recovering from hangovers, bloodying our hands in the autopsy lab and generally having a bad time of it on public transport. Welcome to Nova City. Hair of the dog in this issue is mostly provided by KES Super Strong 8% premium brew. Vile stuff… I’m told. P.S This being my first self published issue, I attempted to write all text by hand. This was a mistake! 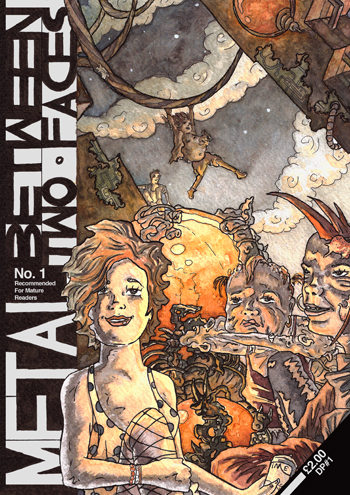 Issue 2 takes care of this, but as a concession I’m selling this batch at a reduced price. Please do pay my blog a visit for plenty of pencil work and development/layout sketches.